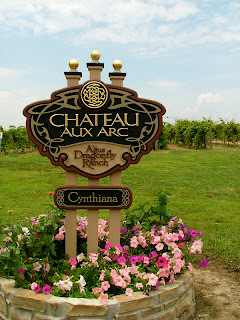 Chateaux Aux Arc in Altus, Arkansas is run by Audrey House, who started making wine at the age of 13 and founded a winery sometime in her early 20s. In a nation where a parent can be arrested for letting a teenage kid take a sip of beer at a party, this is a remarkable achievement. The name comes from the original French explorers' name for the region "Aux Arcs", meaning with curves or with hills. (Alas, I don't think there's a dirty reference in there in the vein of Les Grande Tetons.) Over time this got bastardized into Ozarks. Work took me to Little Rock for two weeks, and I'd heard good things about the winery. 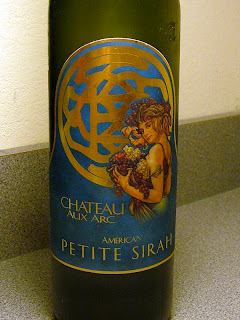 Given the opportunity to try one I picked the 2004 American Petite Sirah ($15, only available in Arkansas). It's got a black cherry aroma, with medium tannins and a flavor that trends towards blackberry. It's honestly one of the better American red wines I've had that didn't come from the west coast, as well as being one of the smoothest Petite Sirahs that I've tried. The following weekend, I got curious and decided to visit the winery and sample some of the other offerings. 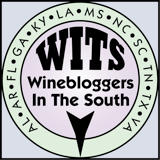 The winery is easy to find and is the first that you encounter on Highway 186 running south from I-40. The tasting room is set mere yards from the vineyards. I strolled over to a patch of Cynthiana (also known as Norton). Took some photos, but obeyed the warnings about pesticides. Besides, it's too early in the season to be plundering grapes. Kudos to the hosts at the tasting room: the menu is presented with dry wines on one side and sweet wines on the other. Sweet wines are far more popular in this part of the country (and often made using Vitis labrusca native varietals or hybrids), but the host passed me the menu with the dry side showing. 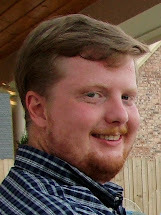 Good man. There's maybe 20 wines on offer for tasting, and I tried six wines that were full of surprises. 2005 Chateau Aux Arc Chardonnay. This unoaked Chard throws a lot of fruit, lots of peach and apples. Tart yet creamy, just a touch of toast. Full bodied but well balanced. 2003 Chateau Aux Arc Syrah. Black pepper and black cherry aromas, another creamy feel on the tongue. Medium tannins with a touch of tartness. 2004 Chateau Aux Arc Cabernet Sauvignon. An interesting Bordeaux-style blend that goes off the rails somewhat and includes Pinot Meunier and Syrah in addition to the standard Merlot and Petite Verdot. Spicy with a touch of bitterness, though somewhat closed. I'd love to try it again with some age on the bottle. 2005 Chateau Aux Arc Dragonfly. The wine that most appealed to my sense of adventure but was the only disappointment of the tasting. This wine is a blend of some 50 different grape varieties, most experimental hybrids made by House. Apparently any and all grapes were used in these pairings. It's impossible to pull out any individual grape characteristics from this wine. Off-putting aroma and a harsh flavor, but I'm still glad I tried it. 2004 Chateau Aux Arc Zinfandel. The wine I liked so much I picked up a bottle for $15. And to give you an idea of some of the truth-in-labeling used by this winery, the wine is actually 99.68% Zinfandel, with the remainder comprised of .12% Petite Sirah, .11% Carignane, .05% Syrah, .03% Alicante Bouschet, and .01% Grenache. It had a touch of mint on the nose with full blackberry flavors. Only 15% alcohol, though the 2005 is 17%. 2000 Chateau Aux Arc Champagne. This is a blanc de blancs made in the méthod champenoise, and with the next bottling they're going to drop the Champagne name in honor of the AOC regulations. Light on the aroma but with pleasant flavors of pear and apple, just a hint of banana. Even though the bottle had been opened the previous day (typically they only sample sparklers on Saturday), it was still crisp with good bubble structure. This would be an awesome brunch sparkling wine. Not many bottles are left from their one vintage, so either get one now or wait for next year's batch. Besides these four, there is a fifth winery in Arkansas called Cowie in nearby Paris. For detailed information on the Arkansan wineries, I'd suggest this lovely profile of the Altus AVA by the good folks at Appellation America. At some point I'll return to the area and hit all five for a proper evaluation. 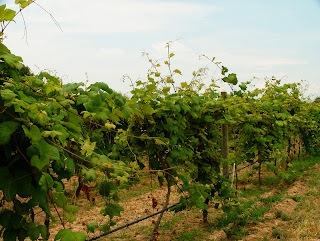 For this trip, it was mostly fun to zip through the scenic countryside seeing rows and rows of neat grape vines. In this part of the country we're used to seeing cotton, rice, corn, and soybeans, so grapes are a fascinating change of pace. Thank you for the positive review! 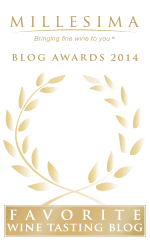 We at the Chateau love to hear good things about our work and our wine! !